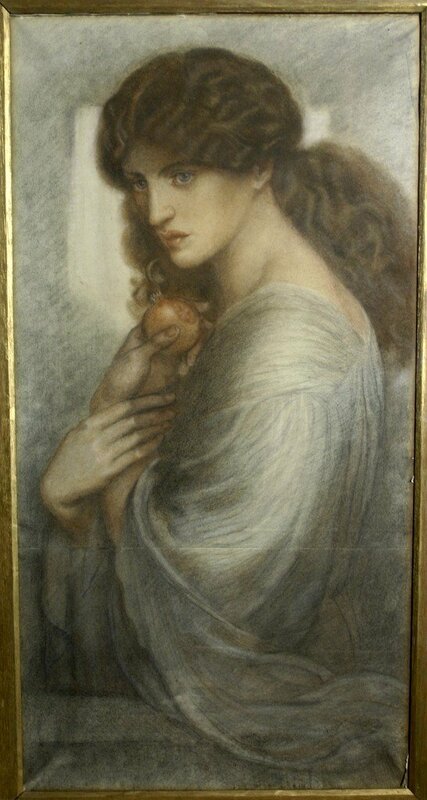 Dante Gabriel Rossetti’s Proserpine has sold for £3,274,500 ($5,275,000) at Sotheby’s in London, setting a new record for the artist. Sotheby’s said a fierce round of bidding, involving five international bidders, was won by a private collector in the UK. Proserpine, depicting the empress of the underworld, is a defining image of the Pre-Raphaelite art movement. The model is Jane Morris, wife of artist William Morris. Biographers have said Jane Morris’ life bore similarities to that of the captive goddess, abducted by Pluto after eating pomegranate seeds, suggesting she was caught between a loveless marriage and her intimate relationship with Dante Gabriel Rossetti. The drawing, in colored chalks, had come to the art market for the first time in more than 40 years and been expected to fetch up to £1.8 million ($2.9 million). Proserpine was begun in 1878, and acquired by Glasgow MP William Graham in 1880. It was last sold in 1970 by the Stone Gallery in Newcastle-upon-Tyne.